Working on a computer every day is tough enough without thinking about electromagnetic fields (EMFs). Yet our exposure to EMFs increases every year, much faster than we can understand how it changes our body chemistry. Just last week, the National Toxicology Program reported partial findings of heart and brain tumors in rats exposed to radio frequency radiation most often used in wireless networks. This big news doesn’t surprise some of us who notice ill-effects from long mobile phone conversations, road trips, or late hours on our laptops. Decisions about where to place WiFi routers, phone charging stations, or vehicle power inverters bring up the inevitable questions: What are our electromagnetic exposures and are they safe? To preface, I do not suffer from chronic pain or insomnia, and I have worked with computers over 10 hours per day nearly every day for over 25 years. But in the past few years I have noticed subtle health improvements away from the computer and cars, and certain environments create fewer side effects than others. These observations have occurred at the same time that portable devices have moved closer into our physical space, taking up space on nightstands, back pockets, or vehicle compartments. 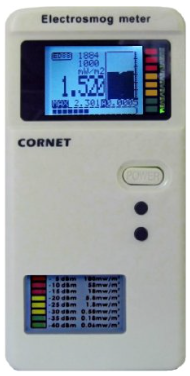 To start, I purchased one of the market’s newest personal electrosmog meters – The Cornet ED88T. This discovery makes sense when we think about how easily microwaves heat water molecules in food. Microwave ovens even conflict with frequencies of our common WiFi routers. But before warming bagels in the network closet, let’s clear up some very confusing concepts. Simply put, EMFs are a combination of electric and magnetic fields that occur when charged particles are zooming around. This process can apply to waves such as visible light or x-rays, but we are most curious about the EMFs from the buzzing technology around us. Radio waves refer to a wide range of waves made by nature (as in lightning or deep space objects) or by humans (such as satellites, radar, or communication devices). All radio waves travel at the speed of light, but we differentiate them by their cycles or frequencies. For example, a radio station uses a specific frequency to broadcast sound to our stereo. As the graphic shows, frequency of radio waves is expressed as hertz, where hertz is the number of waves per second. Waves with higher frequencies have shorter wavelengths and greater ability to transport energy. Radio waves with extremely high frequencies can be damaging to living organisms and are created from radiation such as ultraviolet rays, x-rays, and gamma rays. 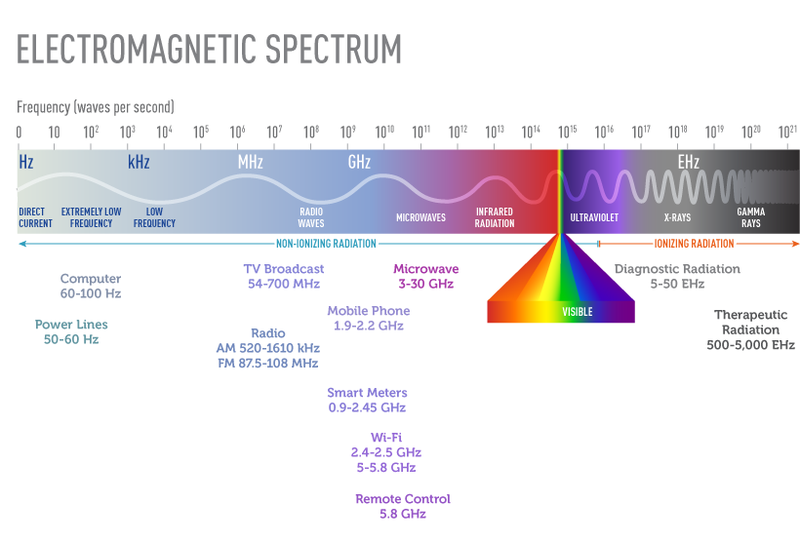 Waves involved in our local EMFs are usually expressed as kilohertz (kHz or 1000 cycles per second), megahertz (MHz or one million cycles per second), and gigahertz (GHz or one billion cycles per second). Terahertz (THz or one trillion cycles per second) is an even greater frequency used for probing deep into tissues or detecting a pocket knife in airport security. Exahertz (EHZ or one quintillion cycles per second) measures x-rays and gamma rays that are highly penetrating. Electric fields are created by charged particles. A stationary charge produces a static electric field with strength that depends on the voltage of the charge. Moving charges produce moving or oscillating electric and magnetic fields. High readings are found next to power lines and electric wiring, and proper shielding can help reduce them. Static electric fields also have no frequency, and they can affect surrounding particles. Thunderstorms, direct current (DC)-powered trains, walking on certain carpets, and high-voltage DC power lines can produce static electric fields. Though static electric fields do not enter the body directly, they may be able to charge particles in the surrounding air and water that get absorbed by the body. Oscillating electric fields happen when electricity flows. These low frequency fields naturally create very tiny electric fields and currents in our bodies. They also naturally generate magnetic fields. Our home electricity moves in alternating current (AC) and cycles at 60 Hz (60 times per second), creating magnetic fields around wiring, appliances, or any devices that are plugged into power outlets. Proper shielding can reduce the strength of the fields. Magnetic fields, unlike electric fields, are not blocked by walls or trees and can enter the body more freely. Magnetic fields are automatically created by the motion or flow of electric currents, and they may cause electric fields to be generated within the body. Static magnetic fields have no frequency, but they affect charged particles including metallic objects and living cells that move through the field. Static magnetic fields include geomagnetic forces in the earth, magnetic levitation trains, and MRI equipment. There is growing concern about how these fields might combine with other fields to affect health. Oscillating magnetic fields are the focus of most health research surrounding cell phone and cell tower safety. They are casually referred to as EMFs, but they can be subdivided into low-frequency magnetic fields (LF) and extremely low-frequency magnetic fields (ELF). They naturally occur around all oscillating electric fields. As in the case of motors, generators, and transformers, these types of magnetic fields can produce electric fields and currents that can penetrate superficial tissue in the body. Even though power lines have lower frequencies than our mobile phones, they have stronger fields due to the amount of power. When plugged into this power grid, our electrical cords produce a constant electric field. The magnetic field is produced once the appliance is turned on and current flows. Electric fields are more constant than magnetic fields that vary with power loads. Transient magnetic fields are pulsed at variable and often high strengths when appliances are switched on and off. When pulses interfere with technology, they are referred to as electromagnetic interference, electrical noise, or dirty electricity. More controlled pulsed EMFs are used as both weapons and therapeutic devices, yet we do not yet understand the health effects of these surges. Radar systems are popular pulsed high-frequency EMFs, and EMFs from radars are called RF fields with radio frequencies between 300 MHz and 15 GHz. As with other EMFs, RF fields require more studies to determine any connection with cancer. Extremely low-frequency electric and magnetic fields (ELF) – 0 Hz to 300 Hz: Many of these radio waves are generated by the earth’s magnetic field, while others are generated as a consequence of electric power grids and appliances – 60 Hz in the United States. According to the World Health Organization, ELF electric and magnetic wavelengths can be very long (up to 5000 km at 60 Hz) and act independently up to 300 Hz. Some ELFs in the kilohertz range can travel through seawater and follow the earth for long distances. Brain waves have a frequency of .5 – 30 Hz. 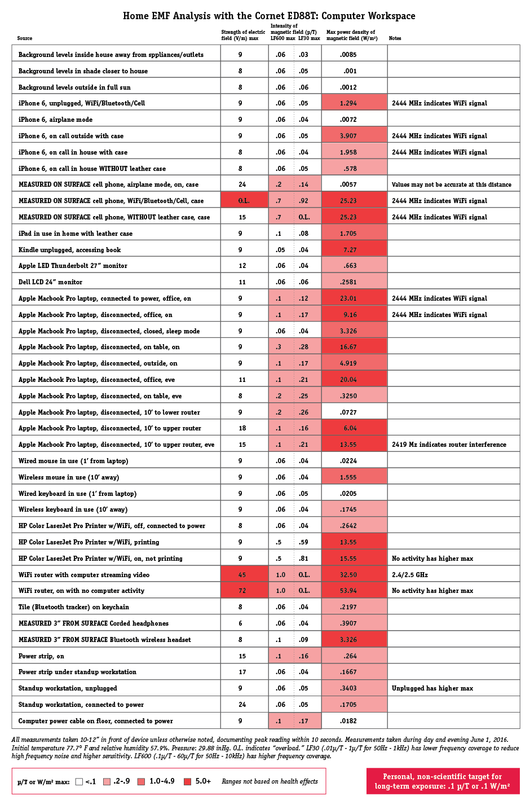 Intermediate frequency (IF) fields – 300 Hz to 10 MHz: These radio waves are generated by technology such as security systems, induction heaters and cookers, and certain computer monitors and television sets. This intermediate range of waves has more industrial applications outside of our current study and very little corresponding health research. Radiofrequency (RF) fields – 10 MHz to 300 GHz: These higher frequency waves are created by mobile phones, Bluetooth and WiFi networks, cellular antennas, microwaves, baby monitors, radar, television, and radio. RF radiation usually moves in bursts. Cellular services transmit anywhere between 824 MHz and 2.2 GHz. In this RF range, electric and magnetic fields closely relate so they are measured as power densities, as described below. On the upper end of RF there is extremely-high frequency where radio waves have a length of 1 to 10 mm. This special group of waves are more readily absorbed by the atmosphere, including humidity and rain. In fact, millimeter wave scanners detect possible weapons in airport security and are potential probes for early-stage skin tumors. The electric field exists as a constant around the voltage. The strength of electric fields is measured as volts per meter – V/m or kV/m. For reference, 1 kV/m = 1000 V/m. With the Cornet, we can compare electric fields around power lines, wiring, and appliances. The Cornet measures the extra-low frequency electric “e-field” between 10V/m and 1 kV/m within 50 Hz – 50 kHz. The intensity of low frequency magnetic fields (LF) is usually described as magnetic field strength expressed in amps per meter (A/m) and magnetic flux density expressed in microtesla (µT). Some researchers still use the older milliGauss (mG) units. For reference, 1 µT (microtesla) = 10 mG (milliGauss). The field strength and flux density are numerically related, so we will simply refer to magnetic field intensity for this comparative report. The Cornet measures strength for low-frequency fields in two levels: 1) LF1 = .1 µT – 60 µT within 50 Hz – 10 kHz and 2) LF2 = .01 µT – 1 µT within 50 Hz – 1 kHz. Power density determines EMF transport energy expressed as watts per square meter (W/m²), milliwatts per square meter (mW/m²), or microwatts per square meter (µW/m²). Electric and magnetic field strengths decrease with distance from the source, so EMF power density also decreases. 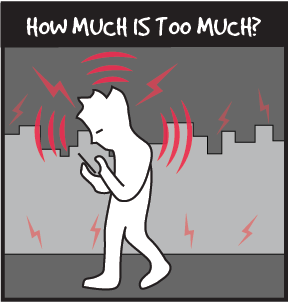 Power density is used by the World Health Organization to describe guidelines for public exposure to EMFs. Still, power density does not fully describe how EMF is absorbed in the body. In fact, the FCC warns that “power density is most appropriately used when the point of measurement is far enough away from an antenna to be located in the “far-field” zone of the antenna.” Near and far fields refer to poorly-defined regions where EMFs behave differently. This means we will want to move farther away from devices such as routers and microwave ovens while reading power density, even though their near-fields may be the most dangerous. The Cornet measures power density for RF higher electromagnetic fields within 100 MHz – 8 GHz: .5 µW/m² – 1.8 W/m². 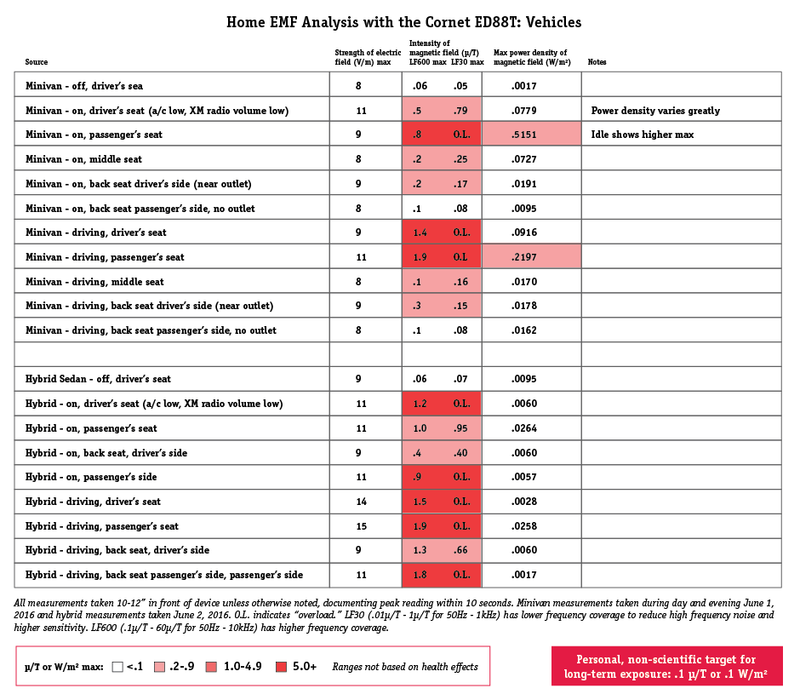 For power density, we can help identify the source of EMF by using the Cornet’s broadcast frequency displayed for frequencies between 100 MHz – 2.7 GHz. For example, a frequency around 2.4 GHz indicates waves generated from a WiFi signal or microwave oven. Smart Meters installed by the utility company (which broadcast data regularly). Different brands of smart meters have different power density values and timing of broadcasts. Refer to the MAX level on the Cornet to refer to this value over many readings over time. The World Health Organization now considers mobile phone use in the same carcinogenic category (2B) as lead, engine exhaust, HIV, and nitrogen mustard gas. Many of the guidelines for our EMF devices are out-of-date. The 1998 guidelines were set by International Commission on Non-Ionizing Radiation Protection recommend frequency and power densities for mobile phones and microwaves. Our Federal Communications Commission (FCC) set standards in 1996, and we have seen many new devices and enhancements like cell phone cases that increase our exposure. Specific absorption rate (SAR) is used to reflect the safety of EMFs in mobile phones until a more accurate system of measurement is developed. The SAR rate describes how much heat can be absorbed by the phone based on testing the device on a simulated adult head filled with liquid. The FCC requires that manufacturers test their products to comply with the SAR limit of 1.6 W/kg, as measured over 1 g of body tissue, the current radio frequency exposure standard. 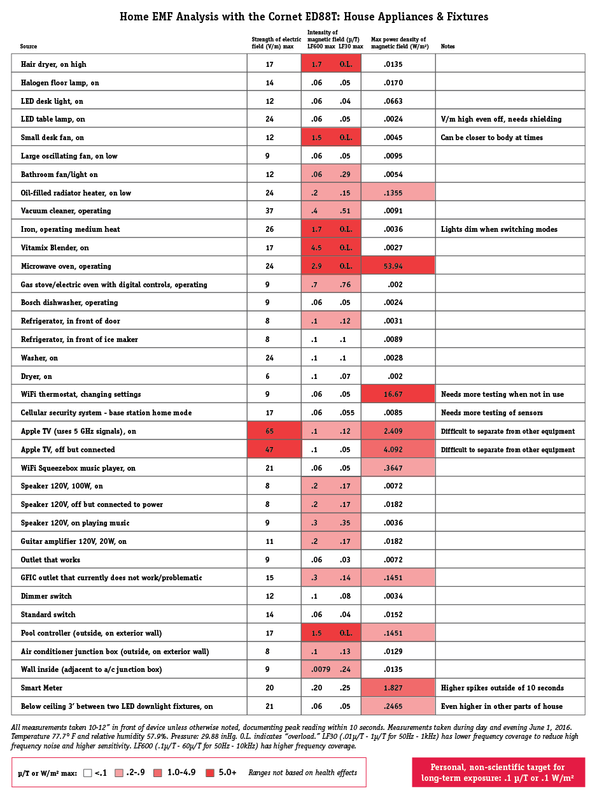 A current listing of phones and their SAR levels are outlined in a CNET article. For iPhone or iPad users, Apple posts SAR values for each portable device and recommends that the latest iPhone be carried at least 5 mm away from the body to reduce radio frequency exposure. Other common cell phone SARs are listed on an independent web site. Six states have exposure limits that are aimed at power line location, but there are no federal limits on EMFs in the United States. The International Committee on Electromagnetic Safety (ICES) offers guidelines on limits of short-term exposure. We are lacking any guidelines on time-based, low-level exposures in our personal workspaces. 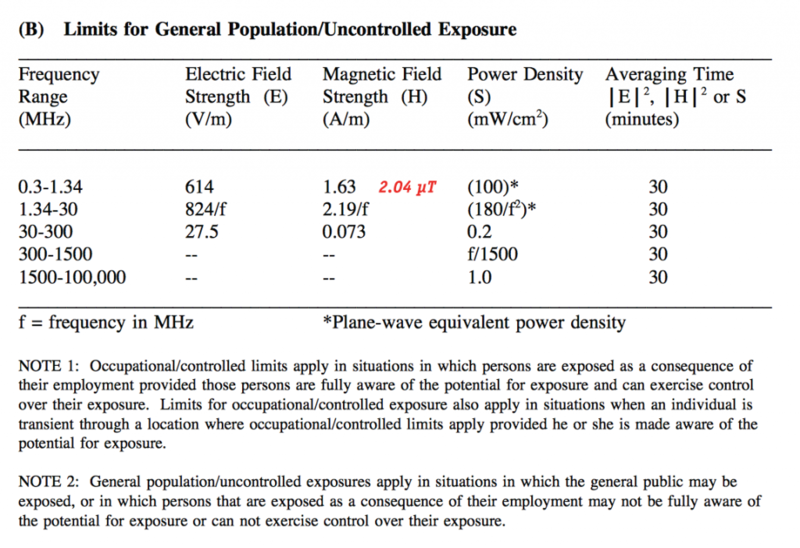 Many years ago, the Federal Communications Commissions published limits for maximum permissible exposure, but this reference does not include the extremely low 60 Hz frequency of electric power in the United States. Cell phones and routers operate in various bands between 824 and 1990 MHz. Microwaves and WiFi devices work at 2400 MHz and 5000 GHz. Without something more perceptive than SAR and thorough body chemistry analysis, we cannot be sure what we are absorbing and how our health is affected. At best, we can limit our exposures by better controlling our living and working spaces to fit our personal comfort and sensitivity until we can quantify our individual risks. I have highlighted data below based on cautious personal goals. Considering the widespread use of radio waves in modern technology, we have just scratched the surface in researching health effects of EMFs. We know that electrolytes in our body carry charges inside and outside of cells, particularly nerves and muscles. We can measure how well our heart carries electric charges through electrocardiography (ECG) monitors. We can measure weaker electric and magnetic fields in our brain waves with electroencephalography (EEG) and magnetoencephalography. But we face a much bigger task when measuring and predicting how electric or magnetic fields affect us. Extremely low frequencies and field strengths are used by humans and animals to signal biological processes. Sharks and birds use EMFs to navigate, and humans rely on EMFs to establish circadian rhythm. Extremely low frequency EMFs in the environment impact our tissues based on many factors such as field orientation, frequency, body size, and body composition. Furthermore, these tiny fields don’t behave in a linear fashion, so we cannot easily predict how exposure duration and frequencies impact individual health. Even without clear evidence, there is a consensus that we should take greater precautions in reducing exposure to EMFs among children. EMFs are absorbed more readily in the brains and bodies of children, putting them at greater risk of health effects. Most research has been concerned with the effects of magnetic fields, but it is important to understand that even simple static electric charges and fields in our environment affect our body chemistry. Positive charges from static electric fields such as aircraft have been suggested as factors in amyotrophic lateral sclerosis (ALS) common to pilots and flight attendants and asthma attacks reported in lightning storms. Exposure to more intense static electric fields from high-voltage power lines can impact adult bone, thyroid, and oxidative stress in occupations. Much attention has been given to childhood leukemia risks around high-voltage electric transmission lines, though results have been inconsistent. A recent study may explain how the challenge may relate to prenatal exposure to high-voltage power lines. Furthermore, it appears that high-voltage power is not acting alone. An elaborate study in Scotland revealed declining leukemia risks of exposure (within 600 m of high-voltage lines) over the past few decades. This insightful paper suggests that the high-voltage leukemia risk is affected by changes in the population or environment. Magnetic fields have not changed around these power lines over time, but there may be changes in the air. In fact, the corona ion hypothesis describes how pollutants are involved in this puzzle. Electric fields can produce ions that attach to aerosol-based airborne pollutants and affect their absorption in the body. Complex weather factors such as rain, wind speed, humidity and even motor vehicle activity can affect the occurrence transport of these charged particles. In 2013, one of the first studies on particles in traffic found that charged particles were detected up to at least 400 m from the road. The presence of heavy-duty diesel vehicles can further increase the number of charged nanoparticles. Considering the corona ion hypothesis, we can imagine how charged pollutants can make simple static electric fields more dangerous. Exposure to mercury in pilots, diesel motor exhaust in truck drivers, lead and mercury in metalworkers, and pesticides in agriculture workers might increase occupational risks in amyotrophic lateral sclerosis or other diseases. Where there are electric currents, there are magnetic fields. Magnetic fields can penetrate more deeply in our body and interact with charged particles, including those within our cells. New research indicates that high and recent occupational exposure to low frequency EMFs increases the risk of ALS. 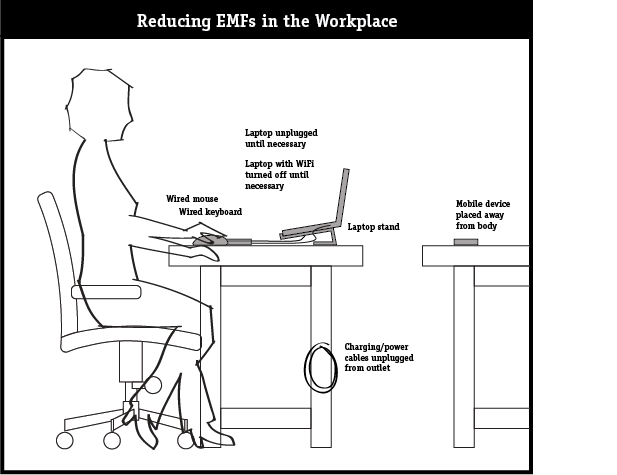 Occupational exposure to extremely low-frequency EMFs is also associated with the risk of Alzheimer’s disease. 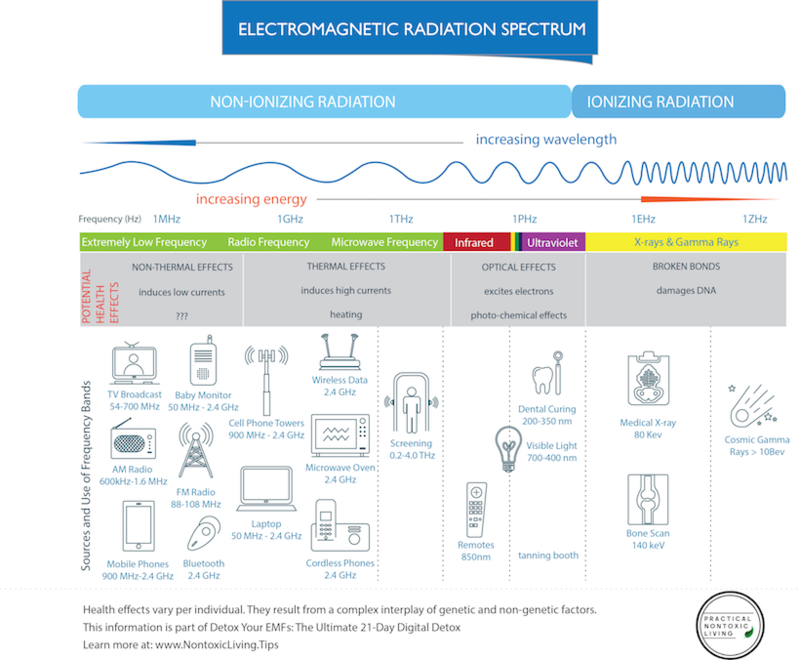 Potential biological effects of EMFs include reduced sperm quality, limited DNA damage, activation of the reactive oxygen species in immune cells, increased superoxide dismutase activity, and mitochondrial-based cell death. We also have clues that fields may interact with themselves as well as other substances to produce unique symptoms. For instance, workers in MRIs can experience vertigo when static and motion-induced magnetic fields combine. Furthermore, researchers suspect that EMFs interact with trace elements and pollutants to increase their toxicity in living organisms. The interaction between EMFs and hormones is the focus of fascinating research in laboratories, even with near-zero magnetic fields. Bone thickness was decreased in animals exposed to long-term, extremely low-frequency magnetic fields. Yet exposure to ultra-high frequencies (1800 and 900 MHz) showed prolonged growth and increased calcium in animals. Other studies revealed decreased thyroid hormones at 900 MHz and decreased testosterone after EMF exposure. Omega-3 fatty acid supplementation provided some protection for male rats. A report on computer workers described decreased TSH and thyroid hormones, and females responded to zinc supplementation. In contrast to risks, we are witnessing potential new therapies using low-frequency magnetic fields for conditions such as pain relief, tumor reduction (via passive RF microchip), and repair of cardiac injury. Tremendously high radiation from terahertz waves also show promise in detecting skin cancer. Surprisingly, high voltage, high-frequency pulsed electric fields (pulsed power) have therapeutic effects in stimulating bone. Extremely high frequency in the millimeter range may even treat skin tumors in the future. Millimeter waves are part of the radio frequency (RF) spectrum, 10-1mm in wavelength, and 30-300 GHz. Data-rich millimeter waves are also being considered for the next round of broadband networks and mobile devices. A German study in the mid-1990s estimated that individuals are exposed to EMFs at a median value of .047 µT per day. EMFs involve moving particles and waves, so they always occur with alternating (AC) currents – not direct currents (DC) generated from battery-powered appliances. Even when an appliance is turned off and plugged in, it can emit EMFs. For some people, the car may be an unsuspected, large source of EMF exposure. Newer research compared gasoline with hybrid cars and found higher averages in hybrids, with average magnetic fields between 0.06 and 0.09 μT. Never use a laptop directly on the body. Place it on a desk or stand with attached keyboard. Pong’s cell phone cases claim to reduce SAR, though remember that SAR is a limited estimation of only thermal effects of EMFs. Ionizers or negative ion generators release negative ions that help balance the excess of positive ions built into air filters. HEPA air filters can reduce the number of contaminating particles. Research cautions that filters of many types can re-release charged contaminants or by-products through inefficient filters or other processes. For many years, I have been happy with our quiet, non-WiFi BlueAir Filters. Consider filters with built-in ionization that enhances filtration. Negative ions are associated with moving or evaporating water. Ionizers that specifically produce negative ions have not been proven to improve health, but increased ions have been associated with enhanced brain activity. Ionizers may also emit ozone which may be a concern in certain environments. Salt lamps are claimed to passively reduce odors and produce negative ions, but their effectiveness appears to be more related to the reduction of humidity in local areas. I have experienced odor-reduction and ambiance from salt lamps, but cannot guarantee that results would be consistent for everyone. The best way to reduce EMFs is to know the source and reduce exposure. The Cornet ED88T helped me locate problem areas and devices that can be easily moved for less impact. I will be more cautious about purchasing new home improvements and appliances with WiFi features, as they continue to increase our total exposure with uncertain consequences. Avoiding exposure to Smart Meters in my home and other homes will be important until the technology improves to reduce emissions. Even though devices may comply with safety rules, regulations, and guidelines, health research will require many more years to influence policy. As new security sensors, Smart Meters, and other personal devices challenge our comfort zone with radio frequency, we face a pressing need to define safe levels of non-ionizing radiation (NIR). New research is revealing that this definition may be a more individualized reading than we ever imagined. One of the most intriguing and least understood discoveries is cancer’s heavy dependence upon hydration within cells. In fact, it has been suggested that cellular dehydration, promoted through static magnetic fields, might prevent the process where cancer cells swell and proliferate. Keep in mind, magnetic resonance imaging (MRI) detects these over-hydrated cells, making it a popular form of cancer detection. Outside of the body, we must consider ways that geology and meteorology impact our body chemistry. Our air can be charged through climate changes and impact local pollution. Electric fields increase with altitude, and positive charges are embedded in certain minerals within the soil. Depending upon the state of the organism, static magnetic fields may influence circulation, reduce allergic inflammation, and work with external factors to promote or inhibit cell growth. Furthermore, is likely that static magnetic fields and other forms of radiation combine with environmental toxins in ways that can be far more damaging than the radiation alone. May the [balanced] Force be with us! My house in Portland has some serious electrical field issues. I bought the electro-smog meter you recommended and the readings are off the charts. I thought it might be the meter, so I checked my neighbors house and everything is fine. I called an electrician and they had no idea what I was talking about. So, how do I find someone that can help me fix the problem? Thanks for article. People should be aware of the sources of harmful electromagnetic radiation and also how to shield EMF.